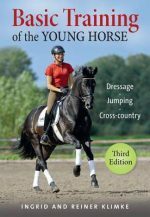 A modern classic by the U.S. Cavalry’s greatest horseman – everything the rider needs to know about selecting, training, and riding the hunter-type horse, from evaluating it’s conformation to basic dressage and jumping. The genius of Brigadier General Harry Dwight Chamberlin’s contributions to horsemanship links a modified concept of Italian forward riding with French dressage and the American cavalry’s vast experience in riding long distances. The totality of Chamberlin’s writing provides a complete protocol to train both horse and rider for Eventing, Show Jumping, Endurance Riding, Hunting, and just plain hacking for fun. In Training Hunters, Jumpers and Hacks he focuses on the training of the horse for various disciplines.